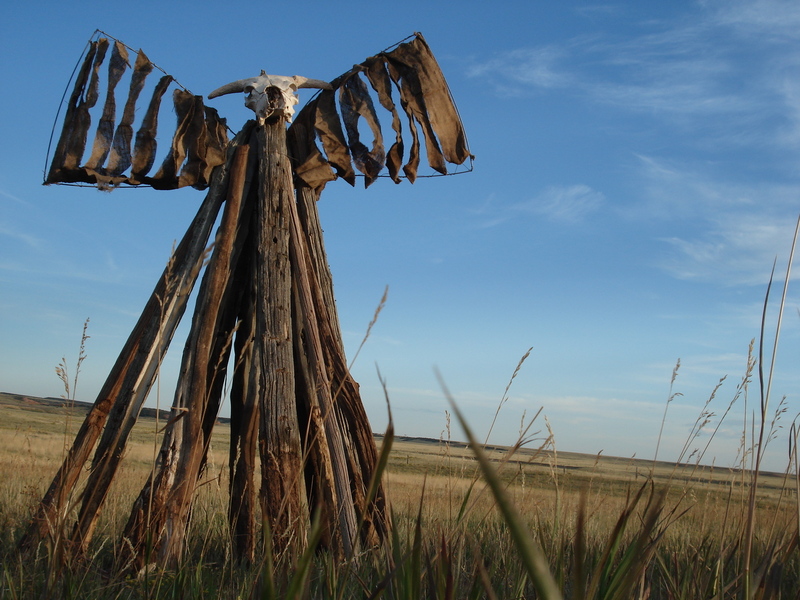 “The Advantage of Death”; old fence posts; cow skull; old burlap feed sacks; bailing wire; prairie; wind; 4′ x7′; 2009; Meg Thompson. I used old fence posts from a recently torn down fence that for decades had witnessed the daily life cycle of the prairie- cows, humans, plants and all. Before they were fenceposts, they were trees from the foothills seen in the background. The cow skull is form a cow that spent her life eating the grass here. The feed sacks that made the wings held the grain that fed the cow. The bailing wire that holds it all together held the hay in bails that grew here and fed the cows. A sense of peace permeates the landscape that I suspect has to do with an acceptance of all phases of life and death that we humans don’t usually embrace. Photograph prints available in a custom frame.